Oh, the hours I spent agonizing over that man in college. His words were incomprehensible to me, his motives unfathomable. What did he mean by that? I asked myself that question over and over, crouched in a near-fetal position in a cubicle, on my couch, at the pub. On a recent trip we had a drink together and I made my peace. Never mind that he had passed away in 1962 and technically, I was the only one doing the drinking. 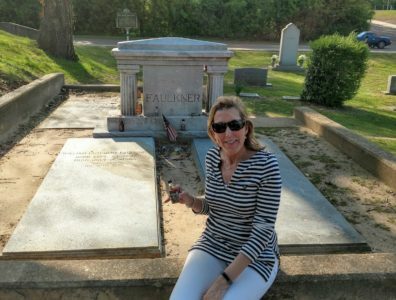 I was at William Faulkner’s grave, downing a shot with the old man whose novels and short stories caused me so much grief. And that tops my list of five reasons to visit Oxford, Mississippi. Oxford is a “great little town, with a lot going on,” according to one local business owner. That was a good summation of my experience, which in addition to taking a shot of whiskey at William Faulkner’s grave, included dining on food prepared by James Beard award nominees, listening to authors reading from their works at a live taping of a radio show and trodding on pink hardwood floors at the collegiate-themed Graduate Hotel. Yes, it’s a college town with its own battle cry (Hottie Toddy!) yet it has so much to offer visitors, you’ll want to take a few days to explore. 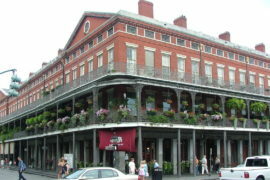 But back to Mr. Faulkner, perhaps its most famous former resident along with author John Grisham. So I knew I had to pay homage to him when I at long last visited Oxford, which has to include taking a shot with him at his grave, an Oxford tradition. I’m not much of a day drinker, but I made an exception for a sip (okay, shot) of whisky at William Faulkner’s grave. Go any day of the year to his grave and you’ll find it filled with mostly empty airplane-sized bottle of various types of whiskey, some tilted precariously as if the imbiber may have had a few already. It’s customary to have a drink with him, then pour a bit of whiskey on his grave so he can enjoy his beverage of choice as well. Tucked back into a residential neighborhood, the stately home sits on 29 acres and is open daily year-round. You can visit the grounds for free, which includes lovely gardens, but for a visit to the home a $5 admission is charged. It’s cash only, which seems to be the bane of existence for the hilariously honest curator, Bill Griffith, who claimed it’s because the university doesn’t trust him with a credit card machine. He also regaled us with tales of Faulkner, including the fact he wasn’t the most faithful of husbands, and that he didn’t believe in air conditioning. Apparently shortly after his funeral, his wife, Estelle, came home and promptly AC’d the heck out of the 1844 home. 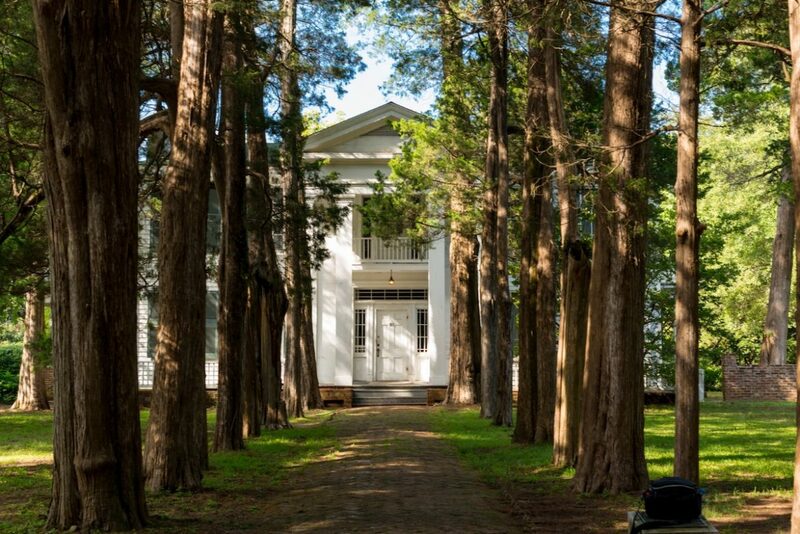 This Greek revival beauty was William Faulkner’s home for 40 years, until his death in 1962. During this time he also had stints in Hollywood, working on screen plays and having a lengthy affair with a script supervisor. They never taught us the fun stuff about the writers we studied in college. 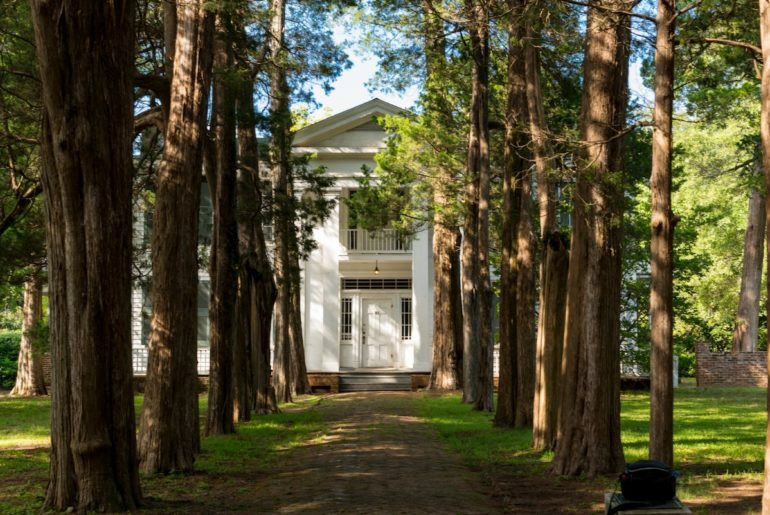 After being thrown from a horse, Faulkner moved to a bedroom on the main level of the home, which you can view just as it was, his typewriter sitting on the desk and the outline for a novel scribbled on the walls of his room. Again, never gonna lose that outline when it greets you upon waking every morning. You can see plenty of his possessions throughout the home – pipes, eyeglasses, books, photos – and listen to recordings of his voice. If you haven’t read much Faulkner, Bill recommends starting with “The Portable Faulkner” as it contains some criticism that helps enlighten his sometimes convoluted prose. “Faulkner novels are meant to be heard, not read,” he said, calling his style of writing first-person narrative. If only I’d had the option to listen to his words back at the University of Virginia as I slogged through nearly incomprehensible sentences, some of which went on for close to 400 words. Can somebody buy that guy a period? Reason #2. You can dine on food prepared by James Beard-nominated chefs or dig into a fried oyster breakfast scramble. 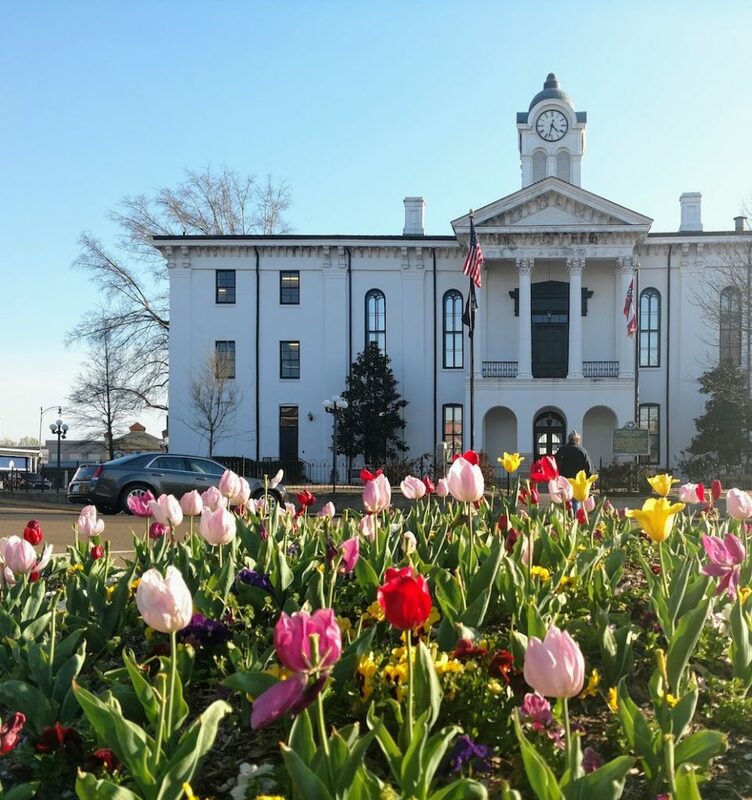 Oxford recently topped the list of best food towns by Southern Living and after just spending a few days here, you’ll know why. Whether you prefer fine dining or chicken on a stick at a gas station, you can get it in Oxford. Yep, chicken on a stick at the 4 Corners Chevron is a beloved dish. While I didn’t have a chance to enjoy that delicacy – I do love me food on a stick – I did indulge in fine dining and against one of my life’s philosophies, tried to down a biscuit bigger than my head. Another place I didn’t get to try is Handy Andy’s Grocery, a red-roof dive looking place that reportedly has the best barbecue in town. Here are a few of the places where I had the pleasure to dine. Ajax Diner. It claims to be one of Eli Manning’s favorite restaurants. (Not up on sports? He was the quarterback at Ole Miss from 2000-2003 and is a member of the Mannings, the first family of football.) I can see how anybody would fall in love with this soul food restaurant right on the Square, the heart of Oxford. With items like Turnip Green Dip, Po-Boys, Hot Tamale Pie and Southern Fried Catfish, you’ll be in heaven if big eatin’ is your thing. And yes, mac and cheese is listed as a vegetable, like any self-respecting southern food establishment. The pizzas at Saint Leo come out fresh and hot. I really loved the bruschetta too. Saint Leo. 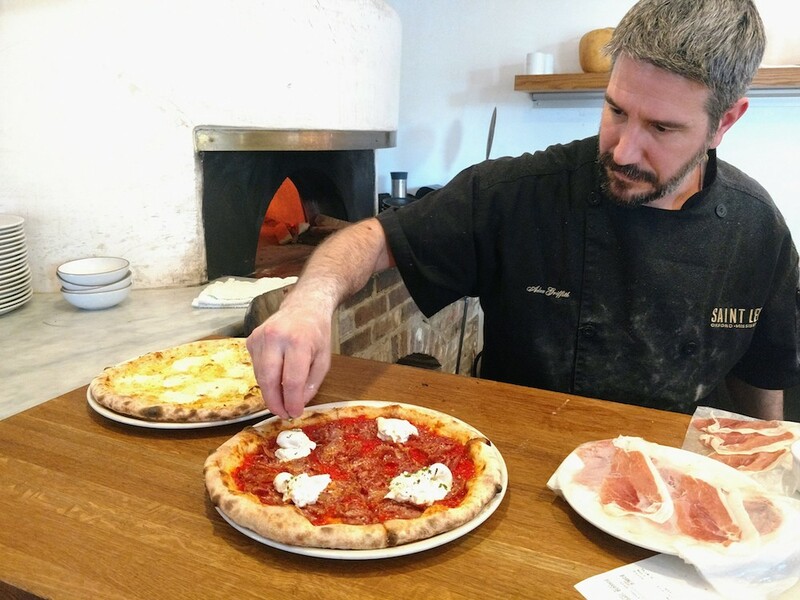 This is your spot for upscale pizza, assembled in the open right in front of the wood-burning fire. Owned by Emily Blunt, (not the actress) Saint Leo was named a Best New Restaurant semifinalist by the James Beard Foundation. The bruschetta, salads and pizzas are fabulous. Be sure to start with a owl of house-marinated olives. 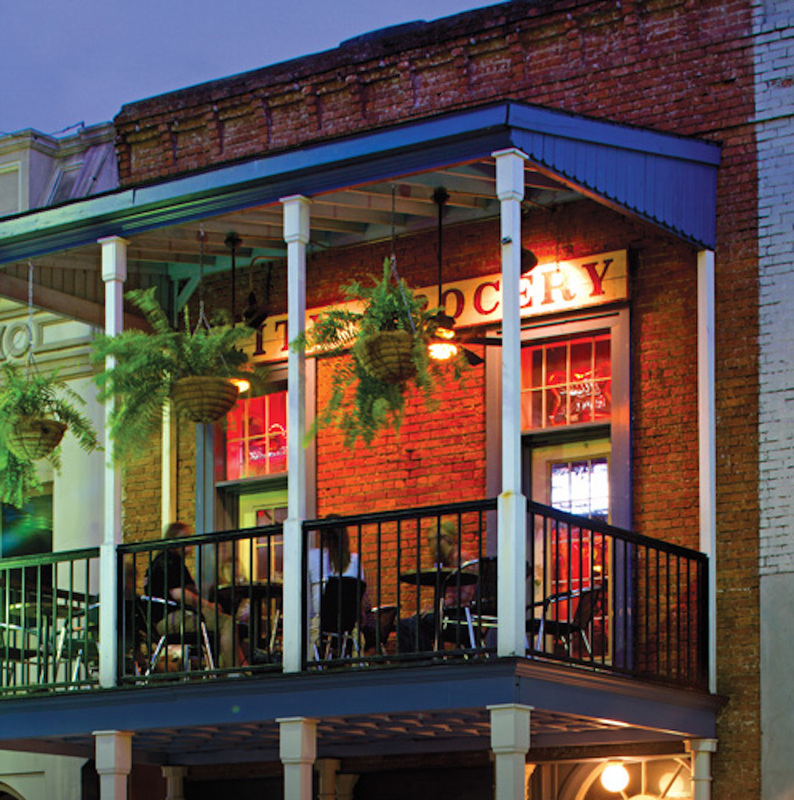 The upstairs balcony at City Grocery, located on the historic Square in Oxford. City Grocery. One of the reasons Oxford has become such a foodie town is due to Chef John Currence who opened City Grocery on the Square in 1992, followed by several other acclaimed restaurants, and won a James Beard Foundation award for Best Chef South in 2009. If white table cloths and candle-lit dining is what you’re looking for, make a reservation here. Oyster lovers will want to try the cornmeal fried oyster. Other items may include shrimp and grits, pork belly, duck breast or pan-roasted catfish. 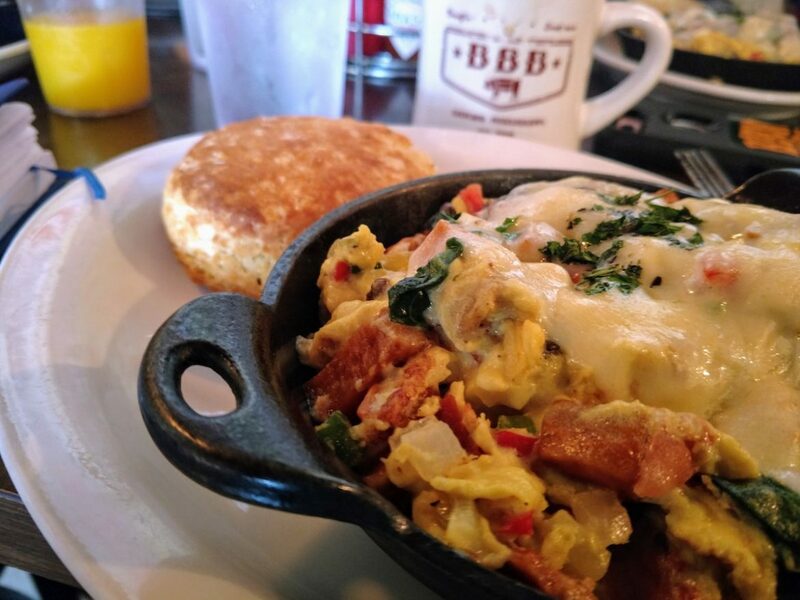 I ordered the Yard Work skillet at Big Bad Breakfast, the only type of yard work I’d ever liked. Big Bad Breakfast. Another John Currence restaurant, Big Bad Breakfast, boasts a menu that intimidated/thrilled/delighted me. Let’s start by saying it includes Big Bad Libations proudly displayed right up top with hearty drinks like Pimm’s Cup, Buena Vista Irish Coffee and its version of a Salty Day, the Sandy. That was my first indication this wasn’t the usual breakfast place. I started with the section called Chef John Currence’s Breakfast Picks for Attractive Folks on the go, because after all, I had applied make-up and my lovely shade of Scarlet Night lipstick so I thought I might pass. Plus, the lighting was dim, and was anyone really going to challenge me on that? After perusing all sections of the menu, from omelets and eggs to lean plates and cathead biscuits, I went for the one of the skillets, because who can resist a dish advertised as “conceived inn love and baptized in a touch of butter”? I got the Yard Work, with two eggs scrambled, lots of veggies (thankfully, no mac and cheese), sweet potato hash and cheese. I gave it my best effort, at least one that would allow me to fit in my clothes on the way back, and made it through about a quarter of it. The biscuit, which violated my policy of never eating anything bigger than my head, proved too much for me, and a bite of that was sufficient. 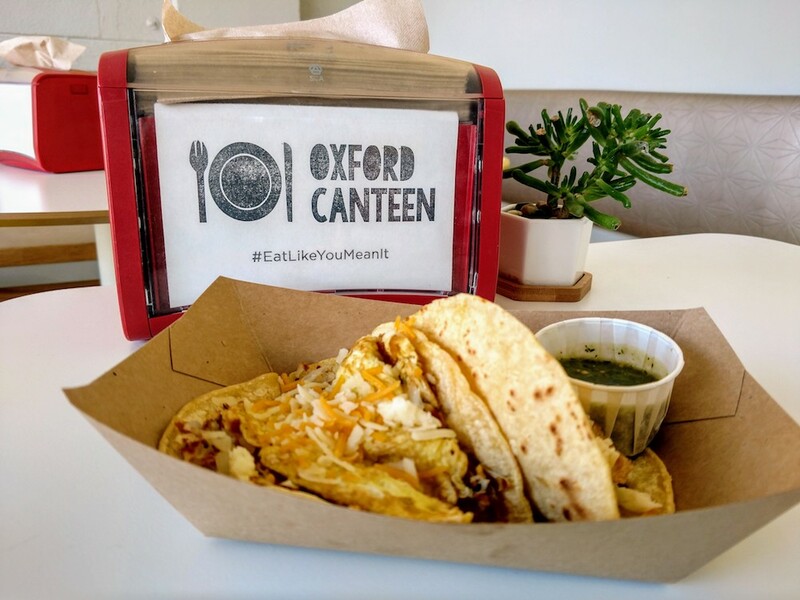 Oxford Canteen, housed in a former gas station as many of the best places are, uses the hashtag #eatlikeyoumeanit. Oxford Canteen. This small gas station turned into a breakfast taco and sandwich place won a place in my heart for its simple décor, delicious tortas, the “eat like you mean it” slogan and because it’s where we had breakfast with John T. Edge. If you have read much of anything about southern food, you have heard of this incredibly gifted writer who moved to Oxford more than 23 years ago. 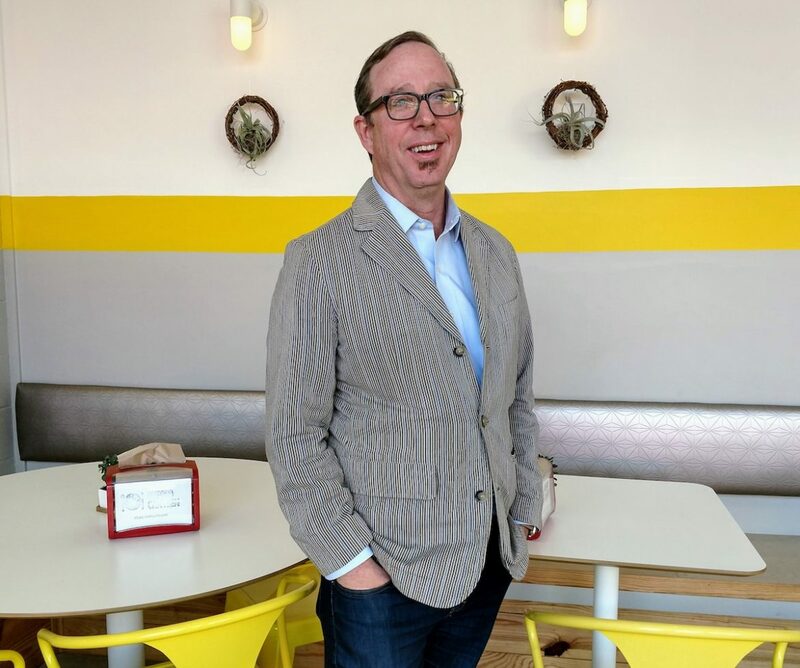 He told me he left a corporate job that was “financially but not morally satisfying.” He found his calling in writing about food, saying he loved a barbecue joint as a child and realized food culture was a way to think about the south. He helped found the Southern Foodways Alliance, an idea he conceived while a graduate student at the University of Mississippi. The organization celebrates and explores the culture of food in the South and hosts several events throughout the year, including the symposium in the fall, which sells out faster than a Taylor Swift concert. Proud Larry’s. Scott Caradine and his wife Lisa opened Proud Larry’s, a popular pizza joint on the Square, 1993. In addition to serving fresh pizzas, salads, sandwiches and pastas, the focus here is on live music. 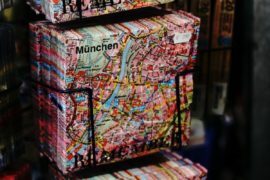 He has hosted artists like Warren Zevon, Elvis Costello and John Mayer and the brick walls of his expansive restaurant are covered with concert posters from the past two decades. I’m doubtful that all those 1970s records stored in our garage have survived the conditions they’ve been subjected to, but I suppose it’s comforting to have our own copy of Rolling Stones albums, warped though they may be. Reason #3 You can visit the most influential book store in the country. Yes, I said book store, and it’s not the most interesting and influential just because its competition is dwindling by the year. Square Books hosts more than 160 author events a year. 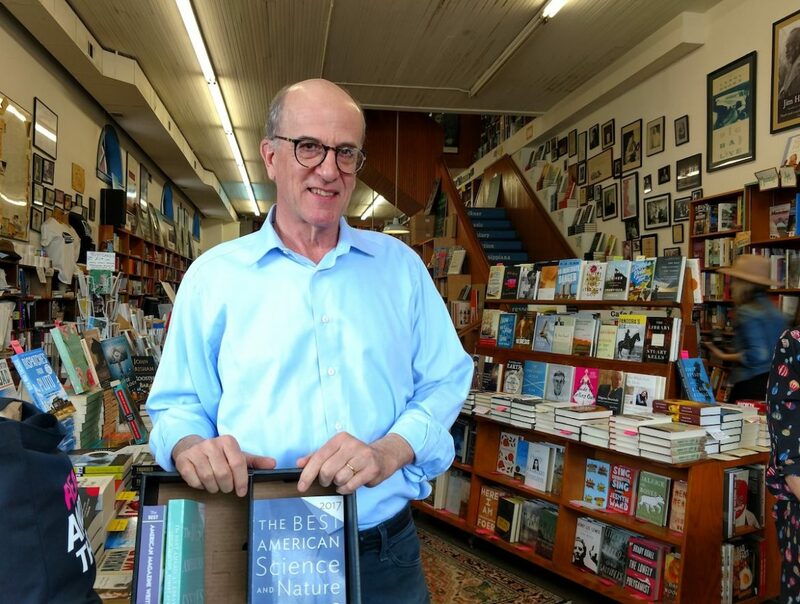 If an author has a book tour, you can bet they will be making their way to Oxford and Square Books, where then-resident John Grisham had his first book signing. Richard Howarth owns Square Books in Oxford, Mississippi, with his wife Lisa. I could spent several hours in here. Be sure to check out the huge first edition selection, then settle down on the porch upstairs with a cup of tea and a book to read. You’ll feel smarter just being there, I promise. Richard and Lisa Howarth opened the store in 1979 and have since expanded it. They added Off Square Books a few doors down in 1993 and Square Books, Jr. in 2003, carrying children’s books. 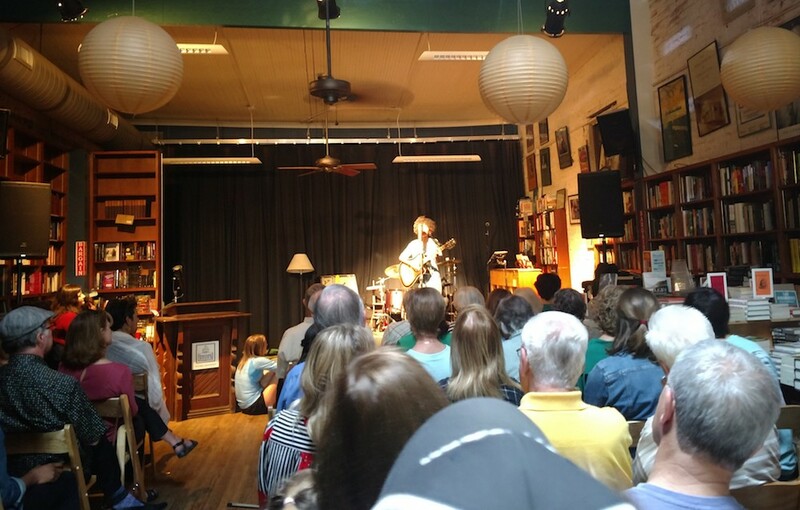 Speaking of Off Square Books, it hosts the weekly live taping of Thacker Mountain Radio Show where you’ll hear live music and nationally known authors reading from their works. My view at the taping of Thacker Mountain Radio Hour, where we sat on mismatched folding chairs and listened to musicians and authors. I loved it. It’s kind of like “Prairie Home Companion” for residents of Mississippi but will fewer sound effects. Or an allegedly creepy host. Richard named the show after a nearby fire observation tower on Thacker Mountain, which at 700 feet, isn’t so much a mountain as a hill that had a good PR firm. Founded by Richard and two Oxford musicians in 1997, the show is recorded and broadcast at 6:00PM on Thursdays, then broadcast again at 7PM on Saturday on Mississippi Public Radio. And it got picked up by Alabama Public Radio so its reach is spreading. You can hear 12 shows in the spring, 12 in the fall, and then 5-6 that are taped on the road. While admission is free, it’s good to get there early to snag one of the mismatched wooden chairs set up across the floor of the bookstore where cases of items have been shoved aside to accommodate them. I’ve been on the radio as a guest a few times, in a studio with just me and Belinda Skelton. And I attended a taping of “Wait, Wait, Don’t Tell Me,” in a 2,750-room theater. But I’d never attended a live show like this one, a small intimate audience where it felt like they were performing just for us. The small crowd was fidgety with anticipation before it started, then the house band revved up the energy with their rockabilly tunes. Their name? The Yalobushwhackers. As is common in Oxford, the host Jim Dees, is also an author, and melodically introducing the musical acts and authors reading from their books, maintaining the flow of the show. The night I was there I heard Tommy Bryan Ledford and the Accumulators (a Thacker cofounder) and singer-songwriter Victoria Jones, a small woman with a powerful voice. The authors Madeline Miller (“Circe”) and Leah Stewart (“What You Don’t Know About Charlie Outlaw”) read from their books and immediately had me making mental notes to add them to my to-read list. One of the books involves turning men into pigs. Make of that what you will. The hour passed way too quickly and as soon as it’s over, a request is made for guests to fold up their chairs, and the room quickly emptied out. We stuck around to meet Victoria Jones and let her know how much we loved her voice. Reason #4 You can attend a festival. Almost every week. People in Oxford seem to love festivals, perhaps the second most popular activity behind legendary tailgates at football games in the Grove at Ole Miss. This10 acres of slightly rolling hills filled with towering oaks and maples trees is Ole Miss’ living room, and scene of massive pre-game parties where food is served on silver trays, alcohol is consumed from blue and red cups and chandeliers hang from tents. 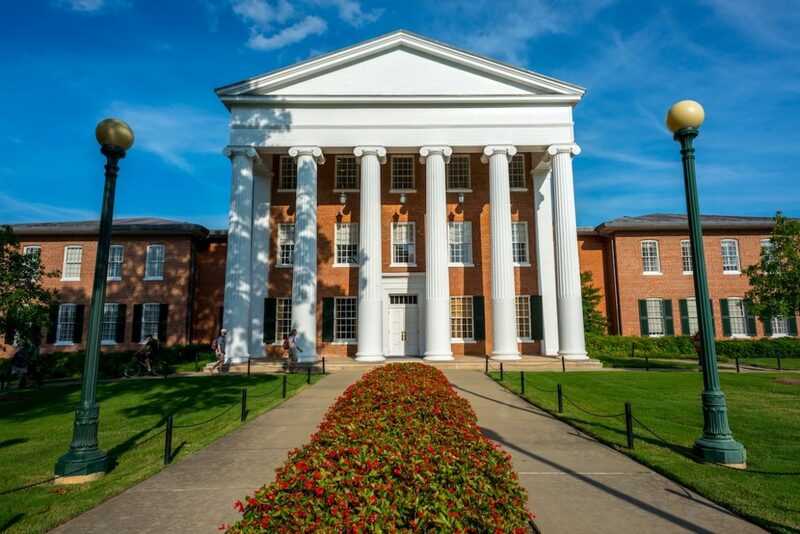 The famous Lyceum at the University of Mississippi, built in 1848 as the school’s first academic structure. Oxford is on the Mississippi Blues Trail so it’s only fitting there are two blues festivals during the year. Blues Today: A Living Blues Symposium is in February, which seems perfect timing for me as it’s generally such a dull, dreary month, why not wallow in a bit of the blues? Then in the sunnier month of June is the Oxford Blues Festival with outdoor performances. Another one of my artsy flower photos, this time on the University of Mississippi campus. 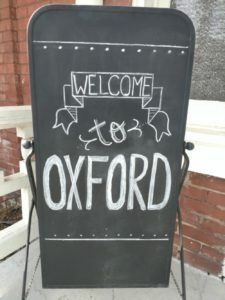 Being a literary town, there’s an Oxford Conference for the Book in March, the Yoknapatawpha Summer Writer’s Workshop in June and the Faulkner and Yoknapatawpha Conference in July. (if you don’t know where that name comes from, stop reading and Google it. You are not allowed to enter the Oxford limits until you know. There will be a test.) There are also craft shows, holiday markets and the University of Mississippi Homecoming Game and Parade in October. Forget trying to get a hotel room for that event. One of the most beloved festivals is the Double Decker Arts Festival held the last weekend in April and attended by more than 60,000 people. The red double decker bus, which hosts one-hour tours of Oxford and inspired the Double Decker Arts Festival held ever year. I don’t know the history of the phone booth, but it provides a cheery spot on the historic Oxford Square. 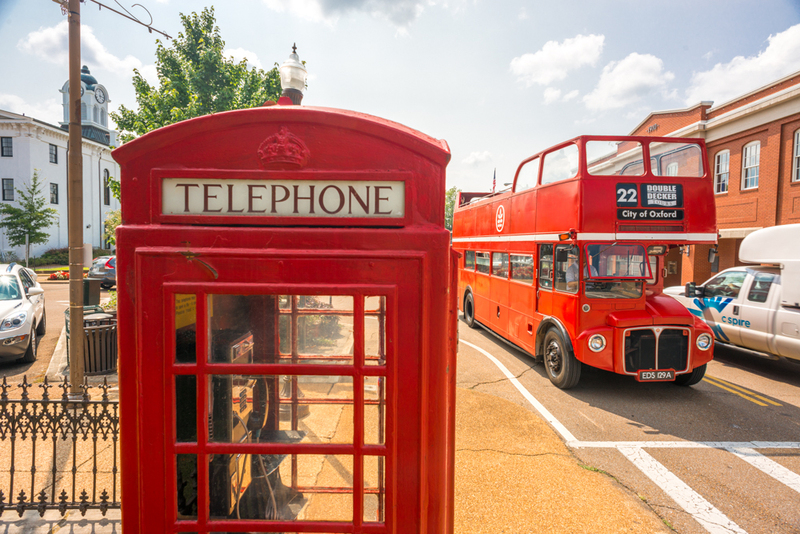 It began as a celebration of the bright red double decker bus Oxford brought over from England that makes its cheery rounds all over the city, ferrying tourists on hour-long tours through the historic square, through the Old Miss campus and other sites of Oxford. The festival celebrates the arts, food and music of Oxford. I was lucky enough to take the tour twice, narrated by Jack Mayfield, a 5th-generation Oxfordian who knew everything and then some about Oxford. 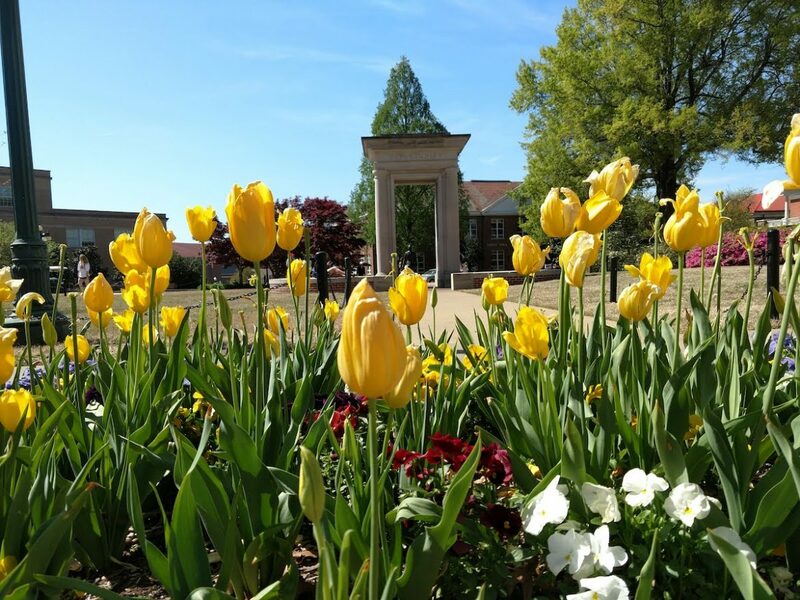 The first time we drove through the Old Miss campus was during spring break, giving it a rather ghostly feel, and the beauty of the campus was the focus. On my second tour the students were back, and the formerly deserted campus was filled with phone-toting, backpack wearing students scurrying off to class. Close to 24,000 students attend Old Miss, which doubles the population of Oxford when school is in session. 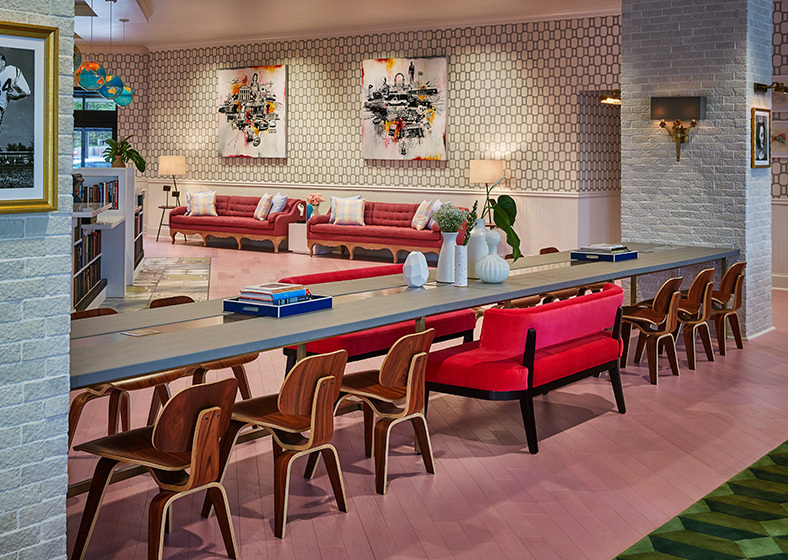 Reason #5: You can stay in a new upscale hotel, or settle into a college-themed hotel that’s kind of like the dorm you wish you had had. 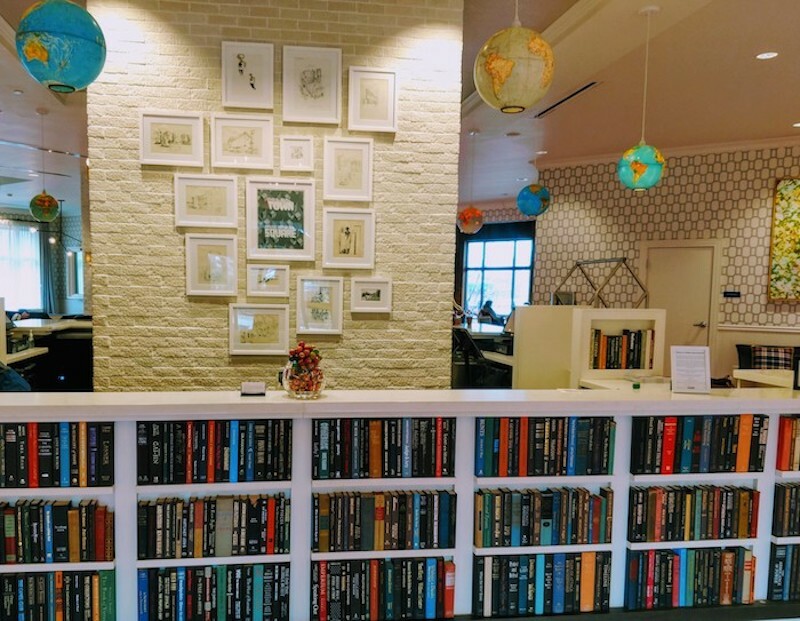 I stayed in the Graduate Hotel on both my visits to Oxford and was immediately charmed by its welcoming, bright lobby lined with bookcases. Only later did I realize the books were all sawed off to achieve that uniform look in the cases, but hey, it’s still literary-themed, right? 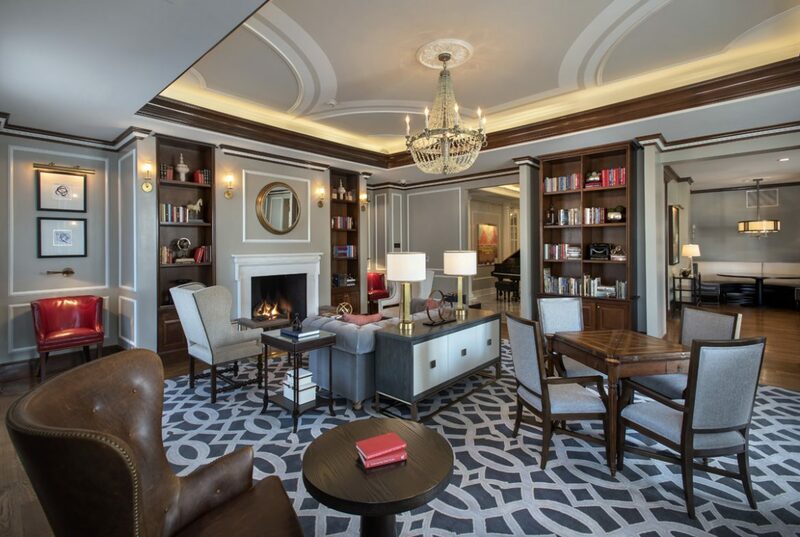 These book-filled cases set the tone for the Graduate Hotel in Oxford. Later I discovered they’d all been cut to fit in the case. But still. Globes hung down from the ceiling and the floors were pink-painted hardwood. The lobby was elegant, a bit whimsical, but comfortable and the curtains were blue-and-white seersucker, the décor chosen in tribute to the sartorial elegance of the gentleman at Ole Miss tailgates. Guests and Ole Miss students work and relax at this long table in the lobby. The café serves breakfast and lunch daily with items like breakfast sandwiches, a Hangover Breakfast with pulled pork and chow chow, turkey wraps, fried chicken biscuits and avocado toast. The Coop is the lounge located on the terrace on the fourth floor with an unobstructed view towards the square, a great place to unwind with a drink. My room key was a replica of a student ID with a card catalog on the back. The rooms contain plenty of college-themed items, like lamps made out of trophies, nightstands made of trunks and my favorite, an old blue book for taking notes. This 136-room hotel is a short distance from the square and about a mile from the Ole Miss campus. The upscale Chancellor’s House has 31 rooms, a fine dining restaurant, lobby lounge, patio terrace and tea room in the library where you can lift your pinkie and eat tiny cream-topped tarts at 12 and 2 every day. 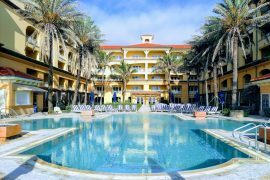 Two rooms have private balconies and pets are allowed up to 40 pounds. The library at the Chancellor’s House. Tea is served here at noon and 2. It was also the scene of our celebrity sighting in Oxford. As we pulled out, we spotted Morgan Freeman pulling in, missing spying on him in the hotel by just a few minutes. I wouldn’t have bothered him – I just wanted to listen to that famous voice in person. After living in New York, Los Angeles, San Francisco and Chicago, he returned to his roots in Mississippi and makes his home in the Delta, where he owns the Ground Zero Blues Club in Clarksdale, Mississippi. Special thanks to Visit Oxford for supplying several of the photos.